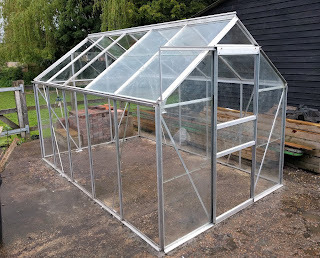 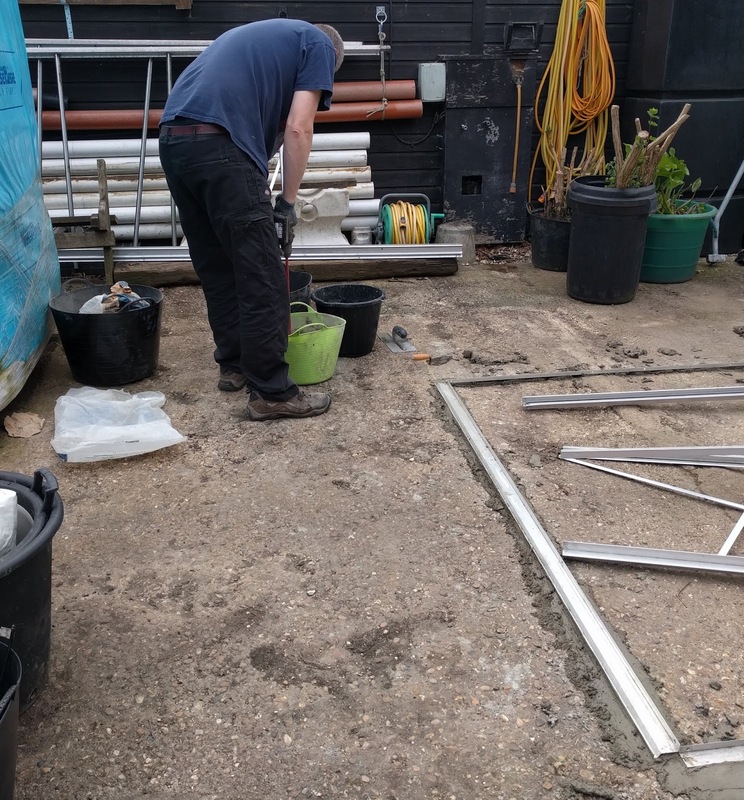 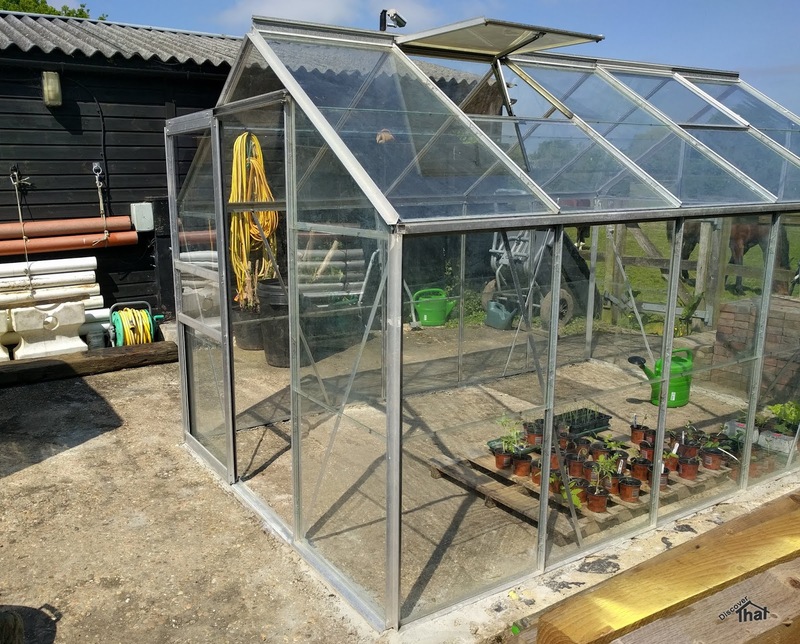 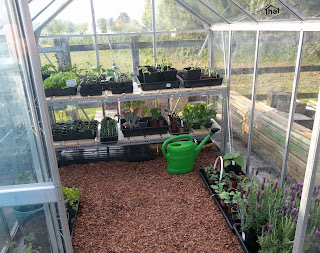 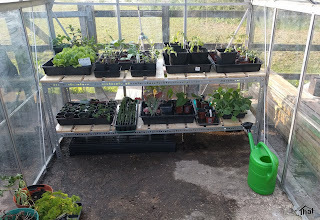 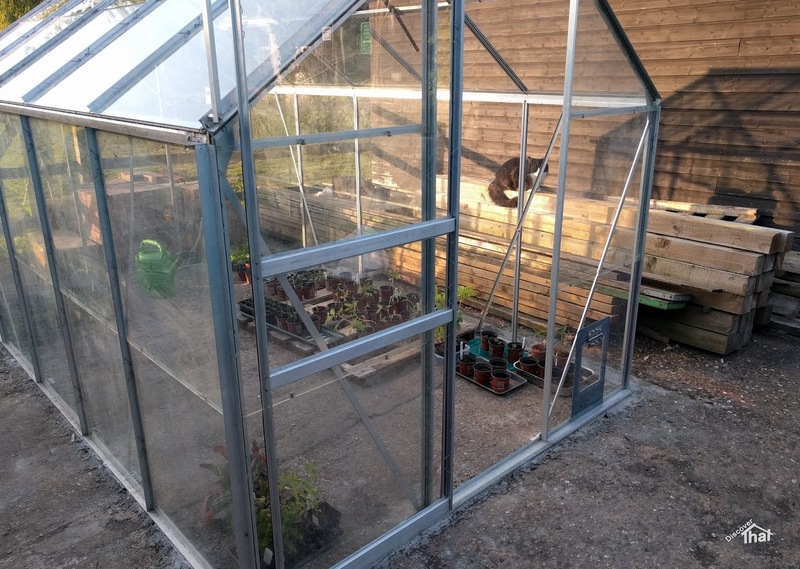 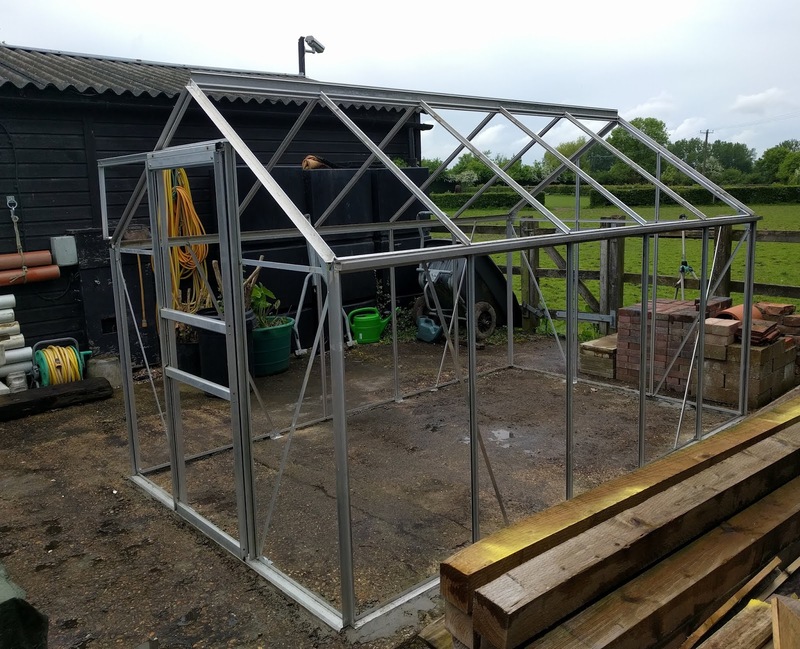 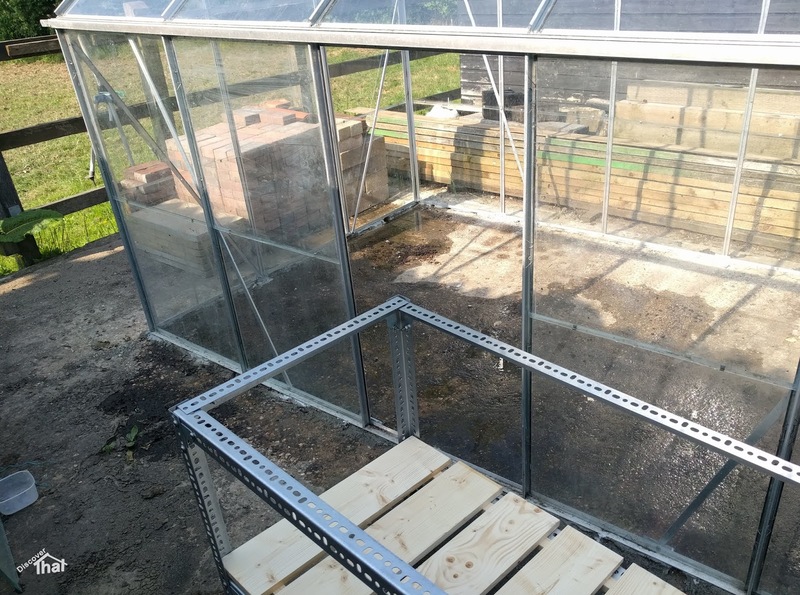 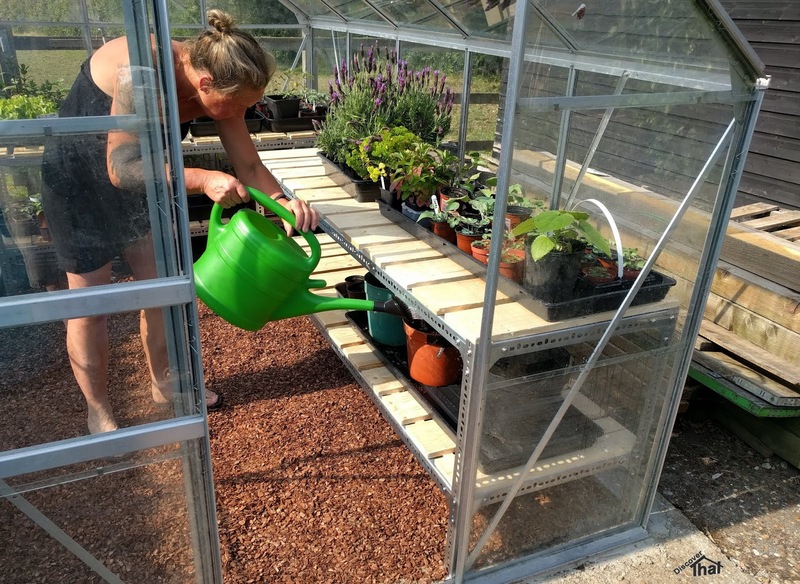 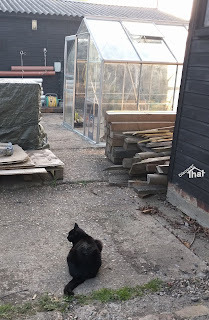 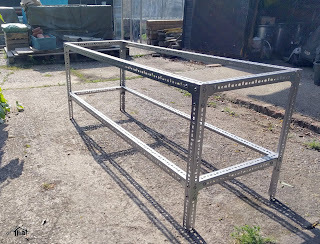 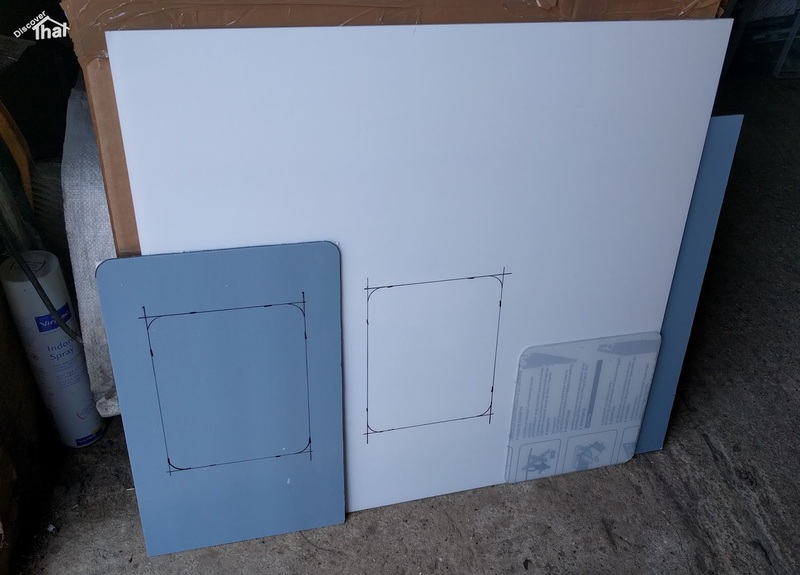 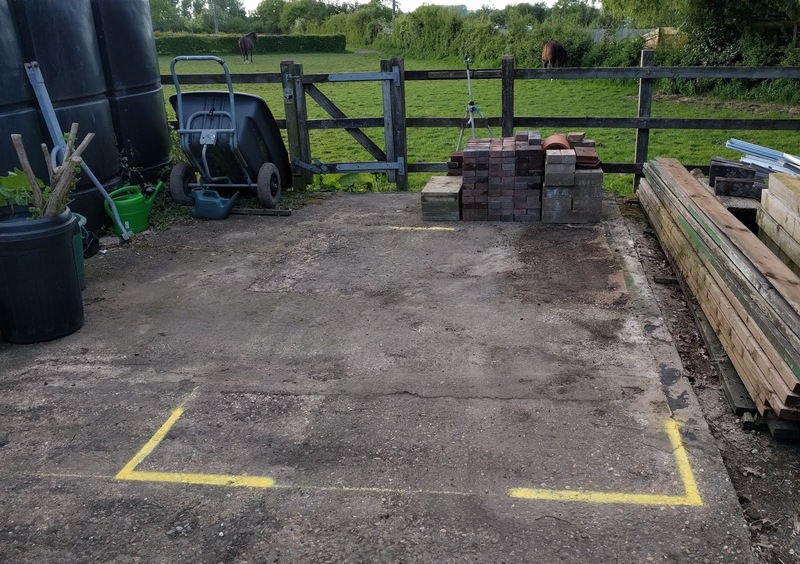 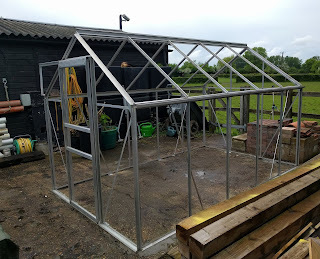 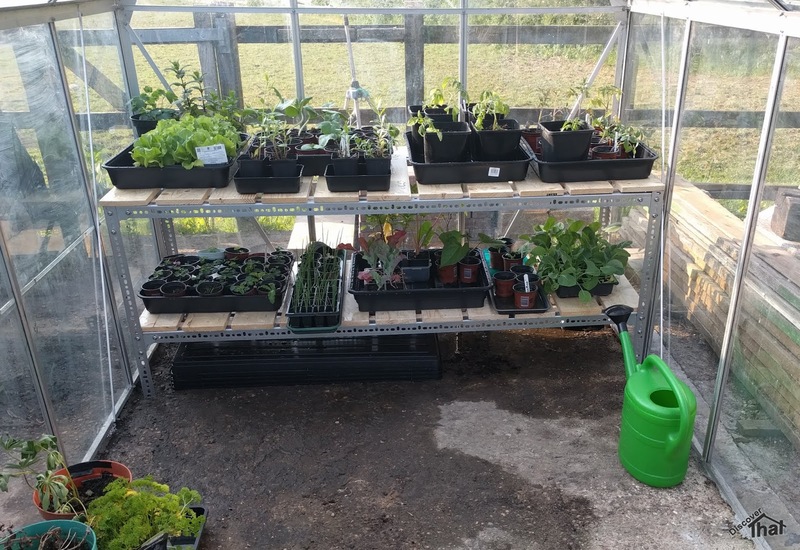 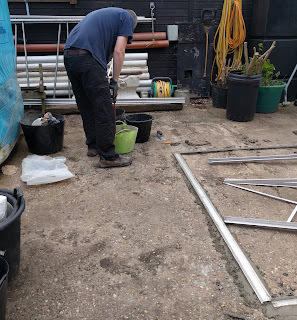 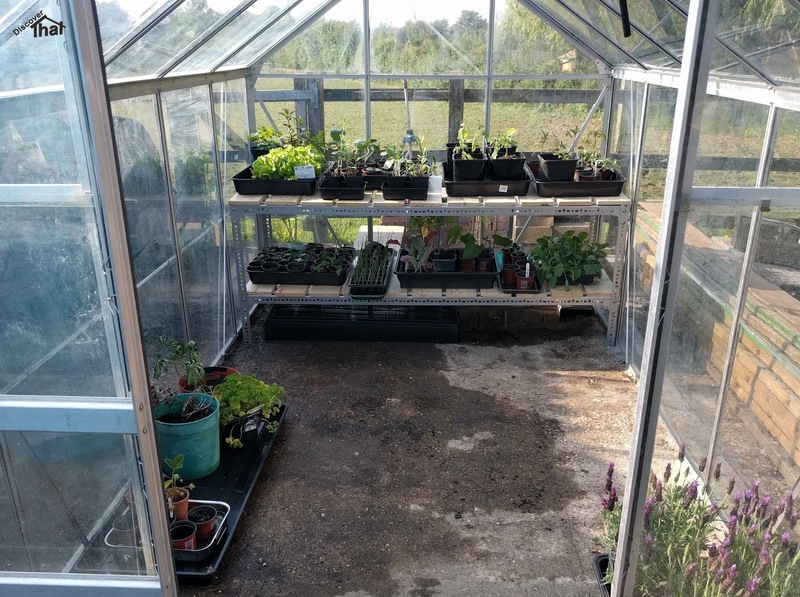 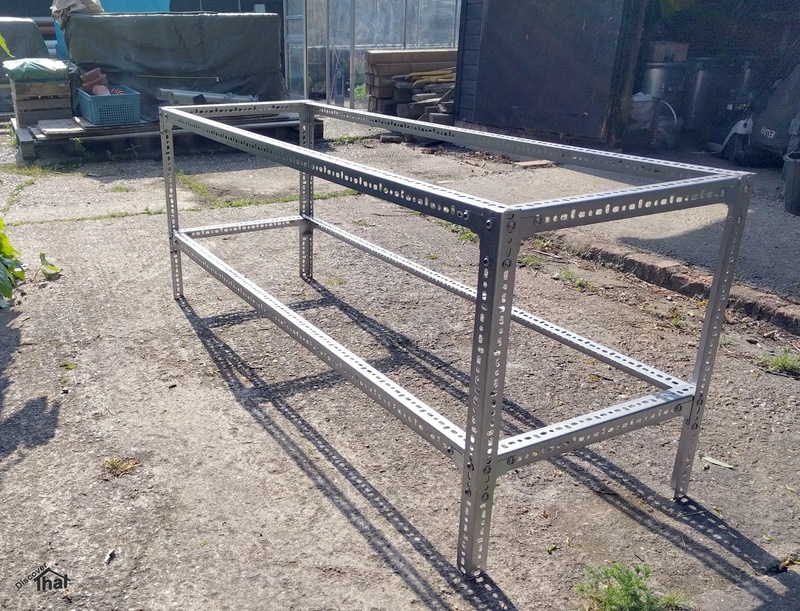 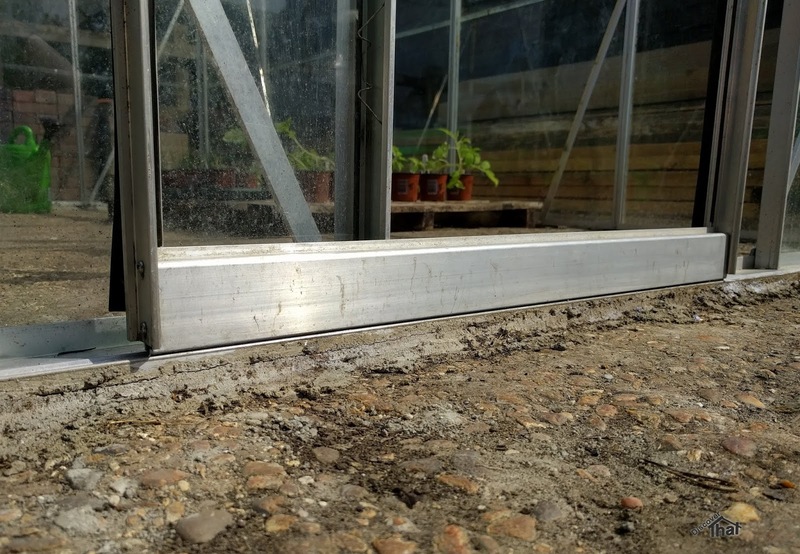 I looked round to buy staging for the newly erected greenhouse but I wasn't completely satisfied that anything was better than I could make for the money. 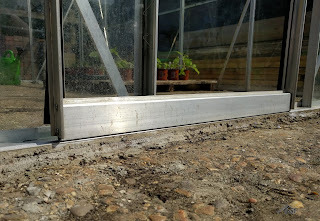 I've used Dexion style galvanised angles to construct the frame and softwood slats for the surfaces. 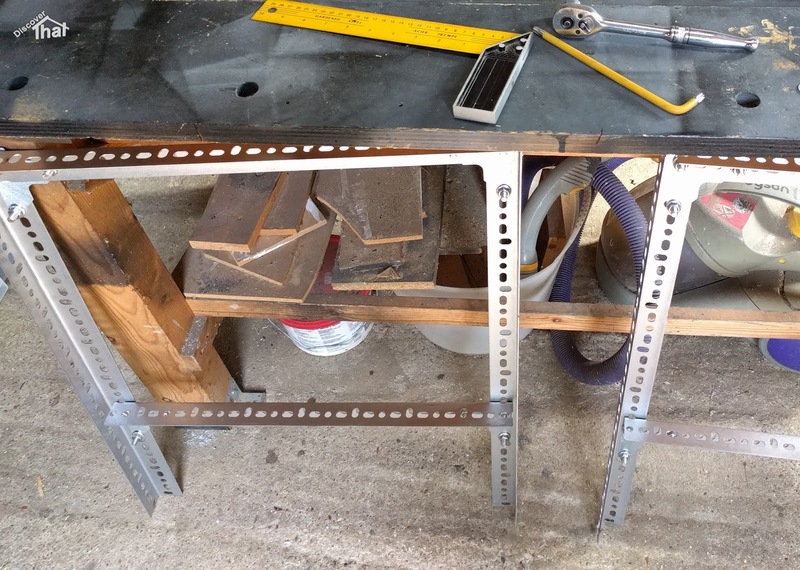 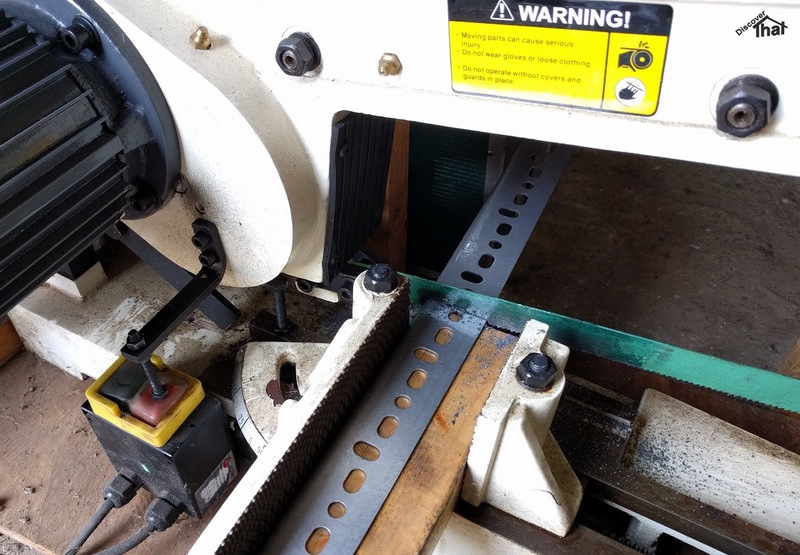 There's a reasonable amount of work to cut the bits to length and tidy up the ends of the metalwork. 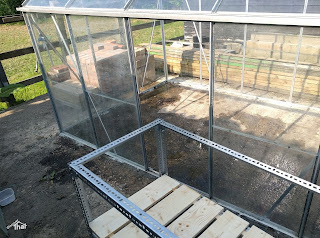 I made it a bit too close to the size of the greenhouse so I had to temporarily remove some glass panes to get it inside. 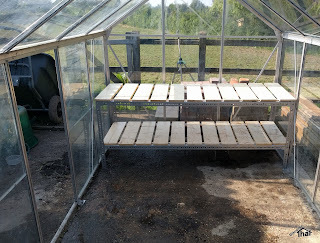 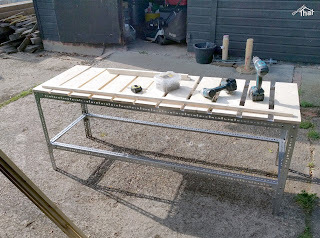 This is the first of two benches that will go in this greenhouse. 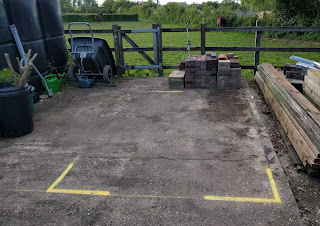 On the following day, I finished the other bit of staging. All of our outbuilding have ways to let cats out so they cannot get accidentally shut inside. 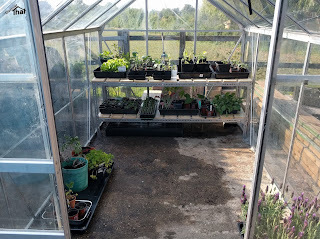 The greenhouse is no exception. 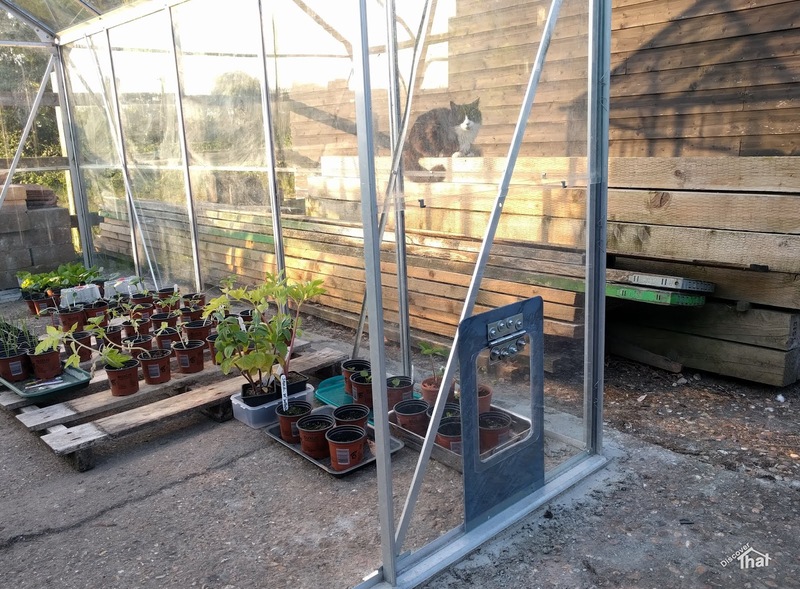 I could have added an off the shelf cat flap but they tend to be chunky and I thought they would look out of place on a delicate greenhouse. 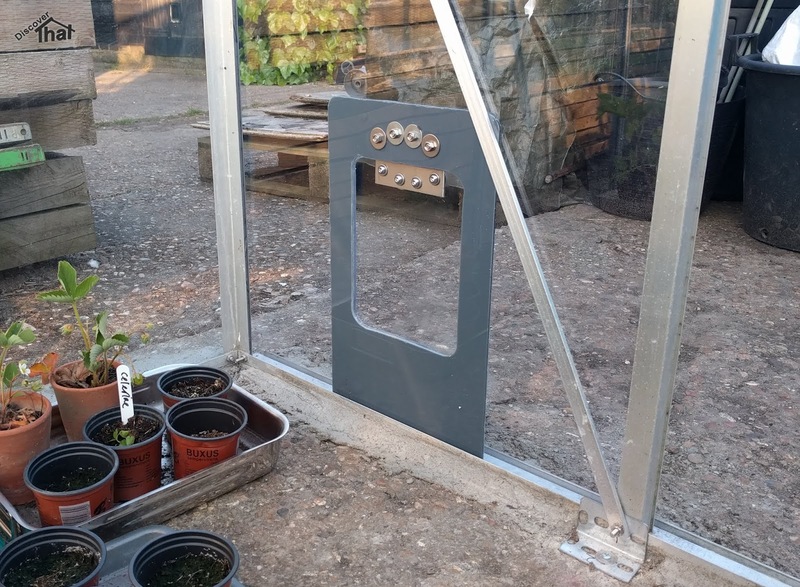 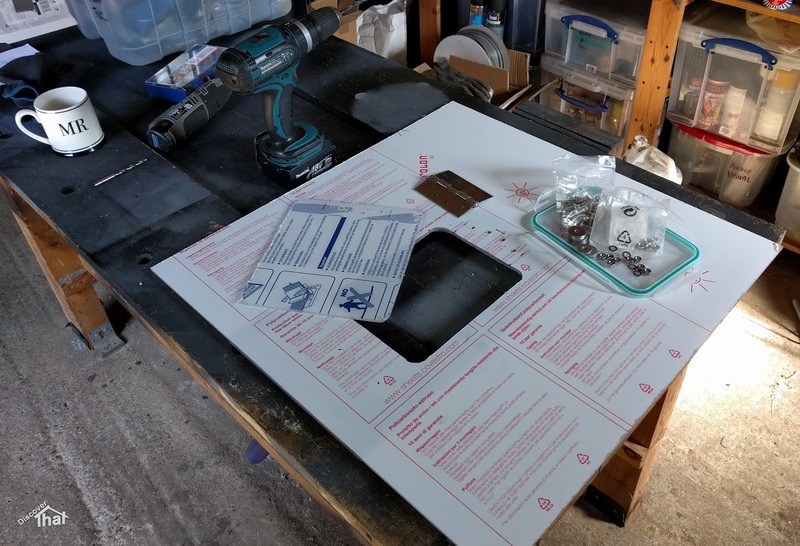 I used a 4mm polycarbonate sheet as the base with a grey acrylic surround. 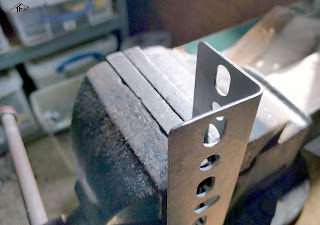 The double thickness was mainly to give it strength where the bolts pass through. I deliberately used a contrasting colour so that the cats would be able to easily identify the place they can get through the otherwise clear panels. The acrylic is glued to the polycarbonate with cynoacrylate (CA, Superglue). 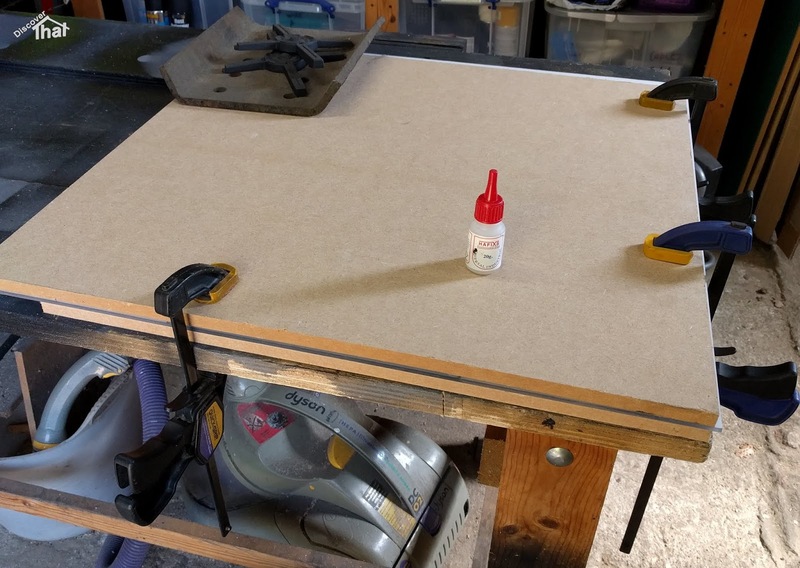 I used a disposable brush to spread it thinly then sandwiched the sheets between layers of MDF clamped together. I only intended to leave it 10 minutes but I ended up going out so it got several hours to set. The joint is solid. 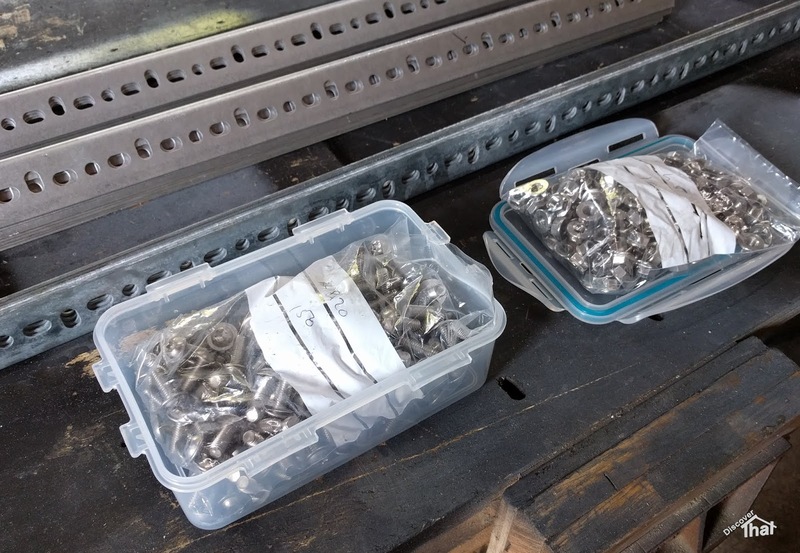 I used M6 bolts with large penny washers to spread the load to hold a large door hinge in place. The hinge only swings outwards. 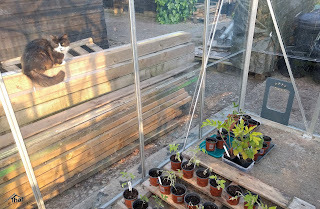 The idea is that it only lets the cats out not in, so they cannot get trapped. 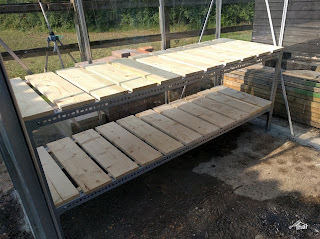 I'm pleased with the result. It looks how I intended. 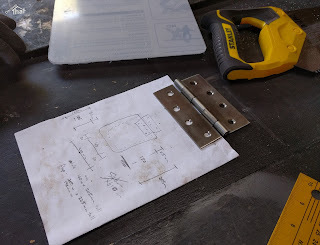 The polycarbonate flap is not quite heavy enough to always close so I might add a weight if it becomes a nuisance. 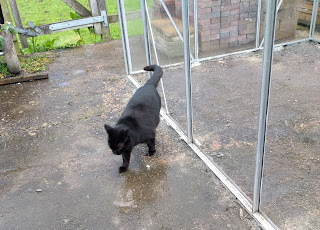 if, as we did, you want to have the cat flap somewhere else, it's easy to move the pane. 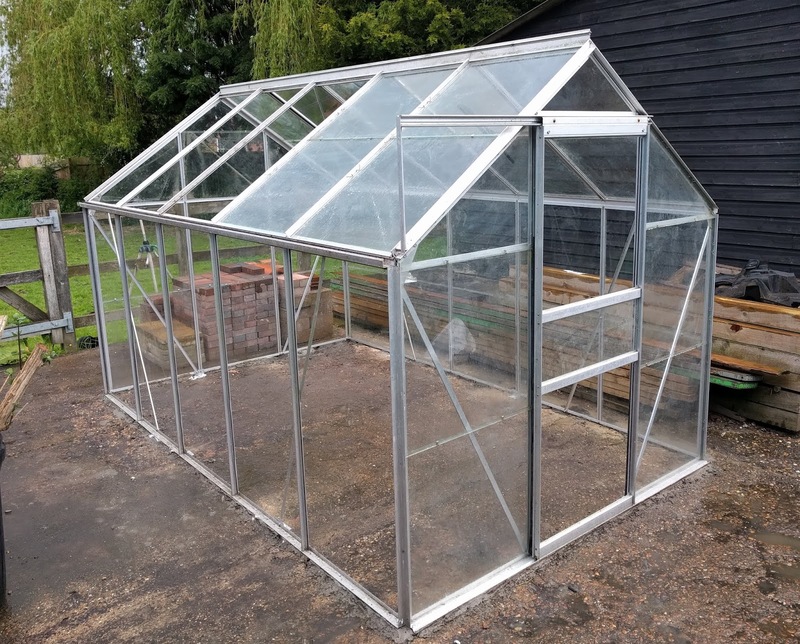 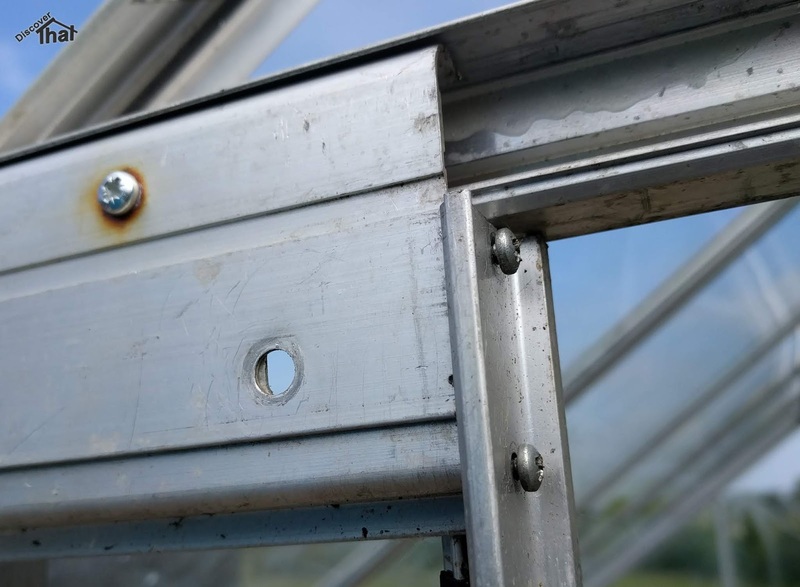 The design of aluminium greenhouses is very efficient. 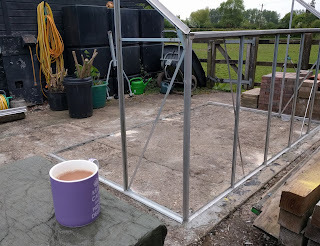 Someone has thought cleverly about how to hold the glass in and be able to assemble and disassemble quickly. 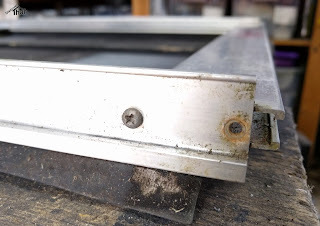 However, the door on most of those that I have come across feels like an afterthought. The doors rarely slide well. 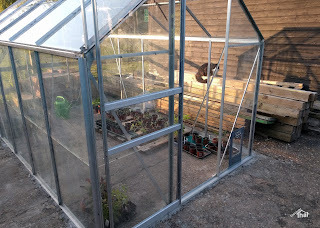 We reused a greenhouse from a friend and the door barely ran at all. 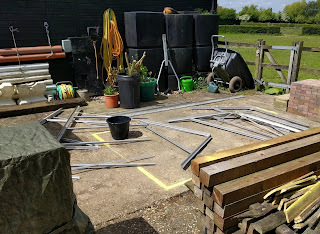 I managed to sort that out. It's not perfect but as long as it is moved from the middle it slides open and closed easily. 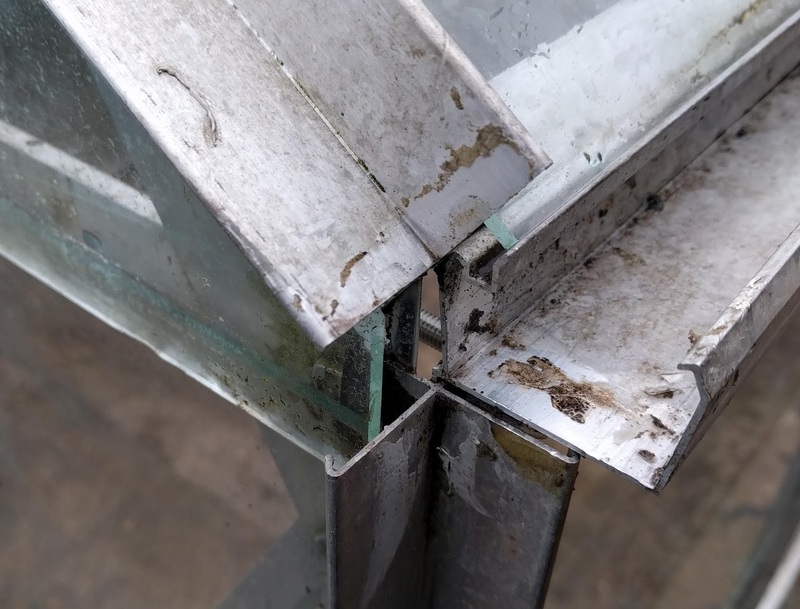 The main problem, as I see it, was the runner at the bottom. 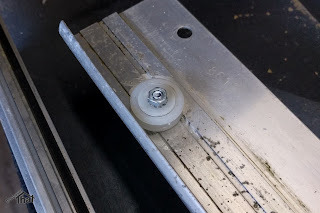 On our's the door hung too low and the bottom rail of the door dragged in the runner. The trouble is there was insufficient height adjustment for the door. 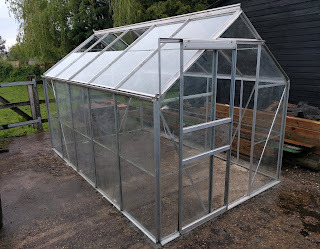 Most people, myself included, don't find out that the door sticks until after having assembled the greenhouse. 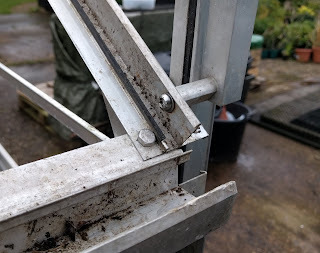 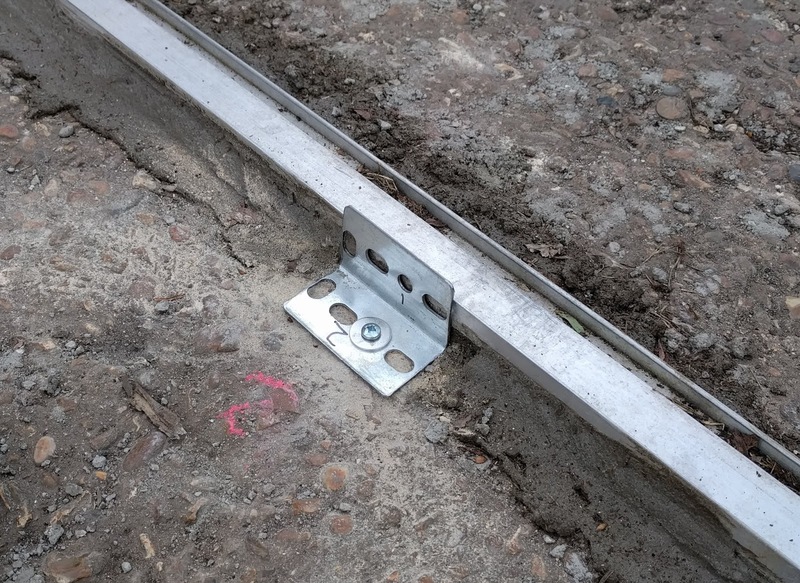 The most obvious thought was to slacken off some of the bolts and attempt to raise the height a fraction. 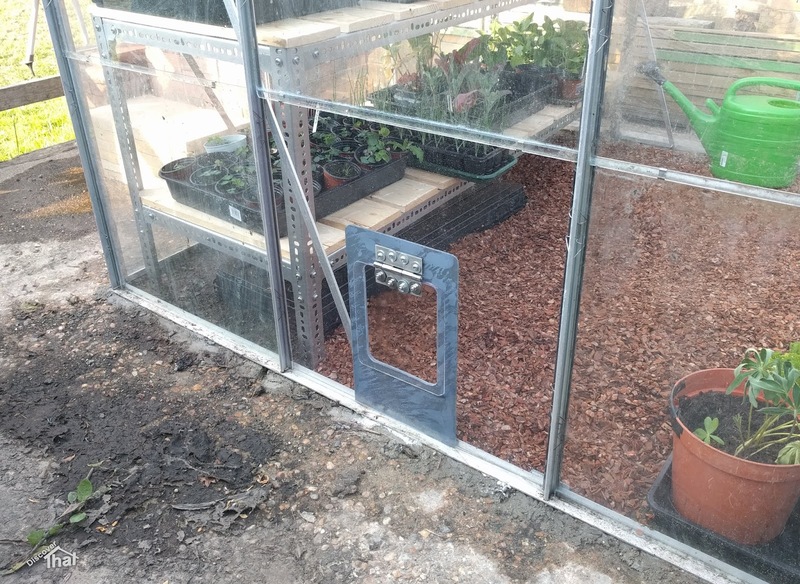 This would require a lot of the glass to be removed for a minimal chance of success. 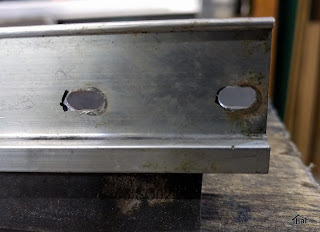 My solution was to file the holes, in the bottom rail of the door, in to slots. 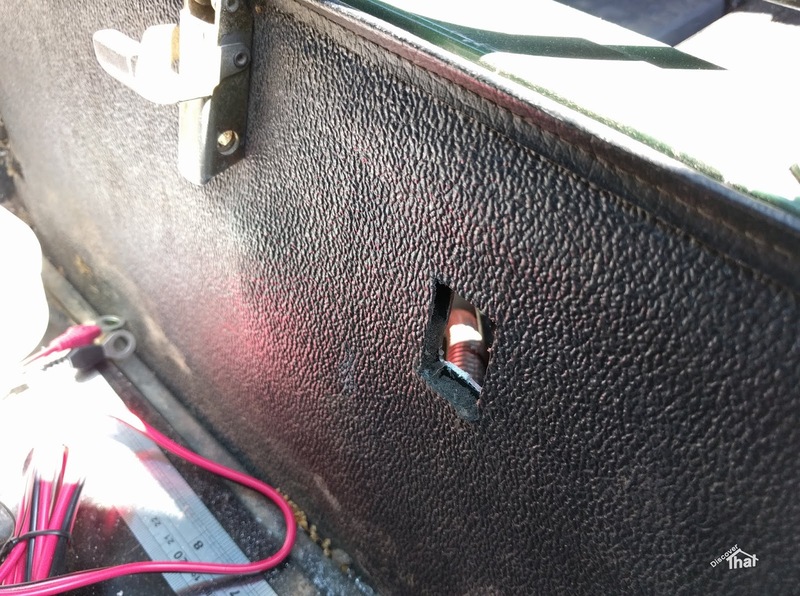 There is no obvious way to easily remove the door. The two bolts holding the top runner to the door frame can easily be undone but that does not release it enough to remove the door! 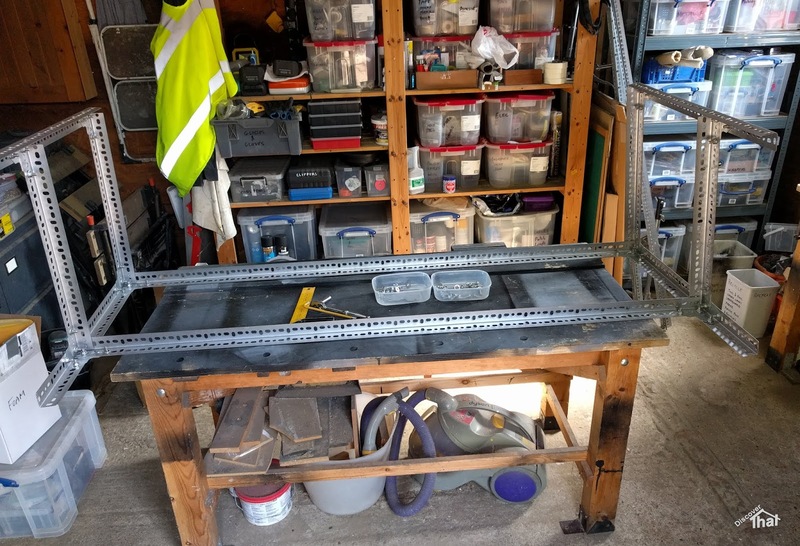 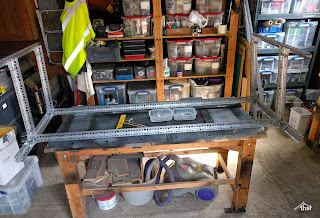 I found that if I slackened off two screws on the top rail, the runner for the door can be released and slid in-front of the door. 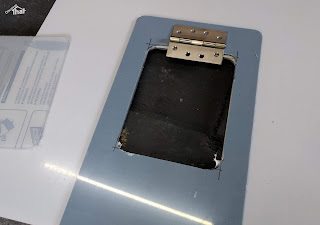 This allows the two to be removed separately. Reassembly was the reverse. 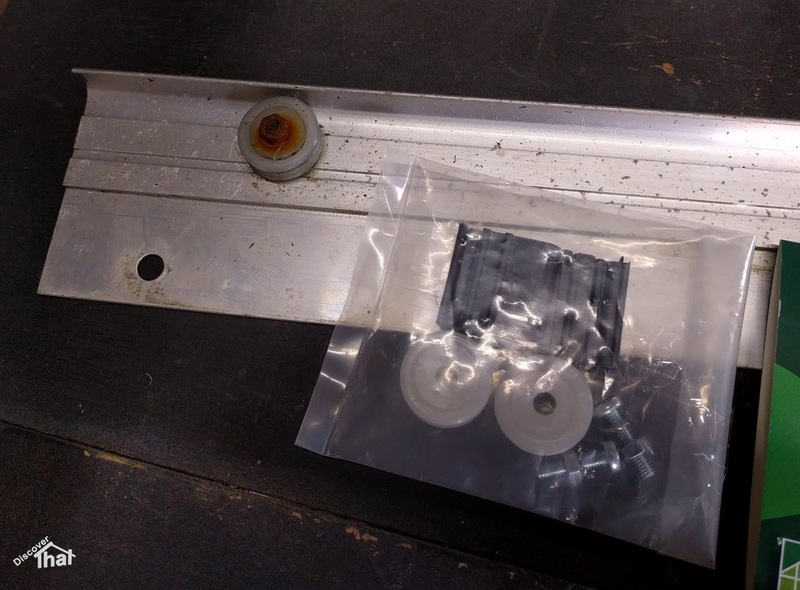 I'm not sure if they were necessary but I fitted new rollers which came in the kit of door repair parts along with the lower plastic guides. 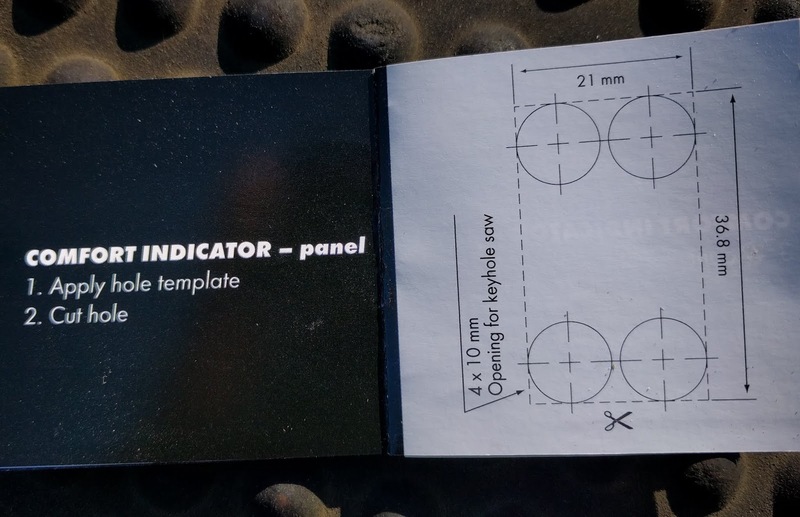 It was the two guides I mainly needed from the kit as both of those were broken on my door. 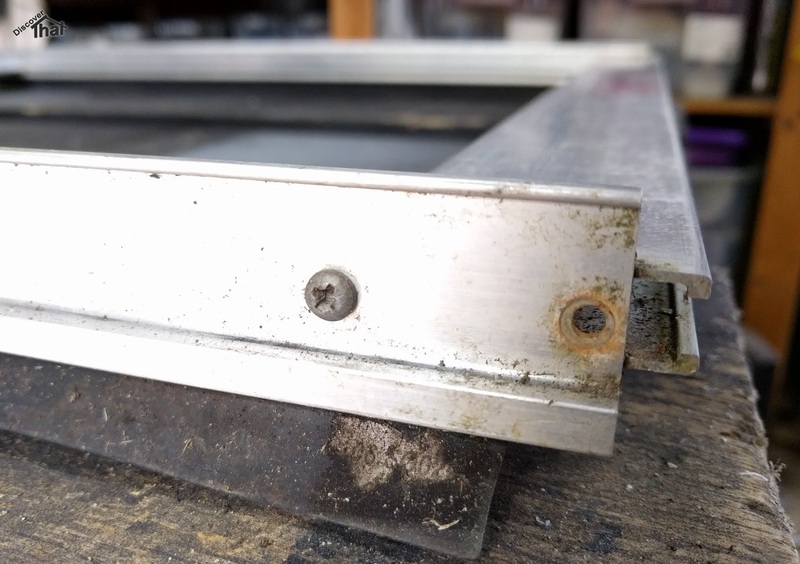 There is a tiny bit of adjustment at the top of the door but that also needs some clearance or it sticks under the top runner. My modified screw slots in the bottom rail was what enabled me to get a good, perhaps 2mm, gap between the guide runner under the door and the lower rail. 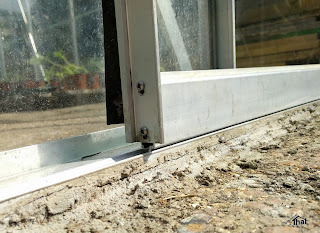 Luckily the glass still fitted in the now smaller aperture. 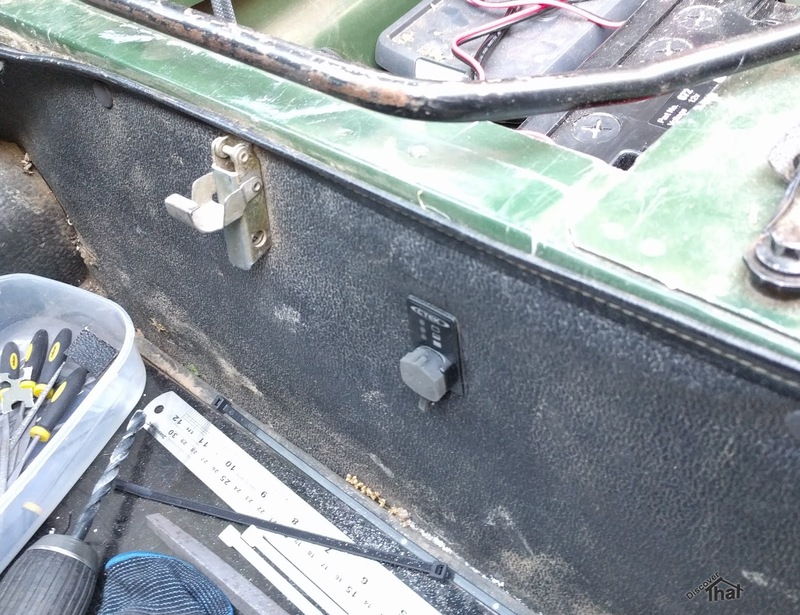 Due to the short hops between jobs, that Shelley does in her Defender, it risks flattening the battery. 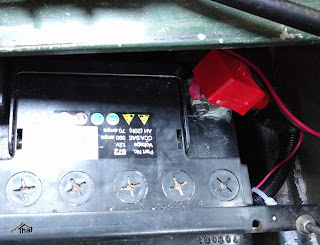 I thought about adding a bigger battery or dual batteries but all that does is delay the problem. 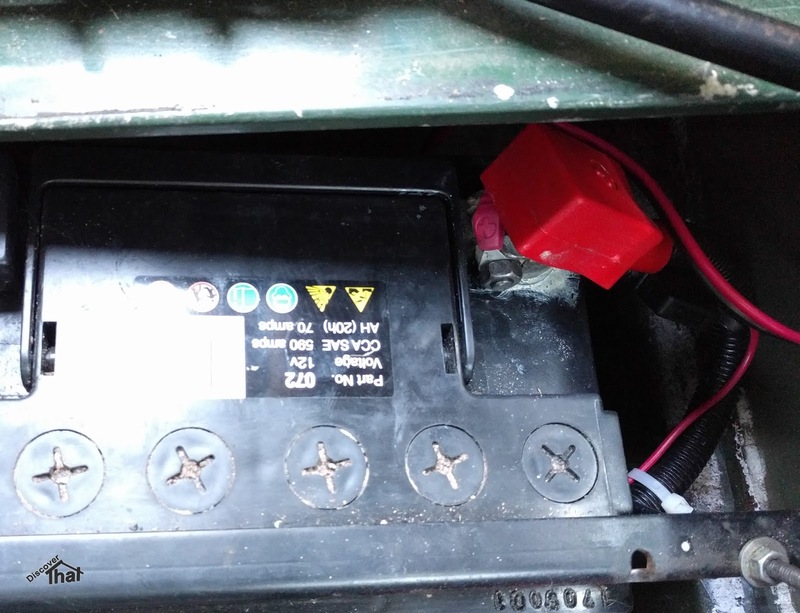 The simplest solution is to monitor the battery and charge up before it becomes a problem. I have ordered a dash mounted battery voltage monitor but that has not arrived yet. 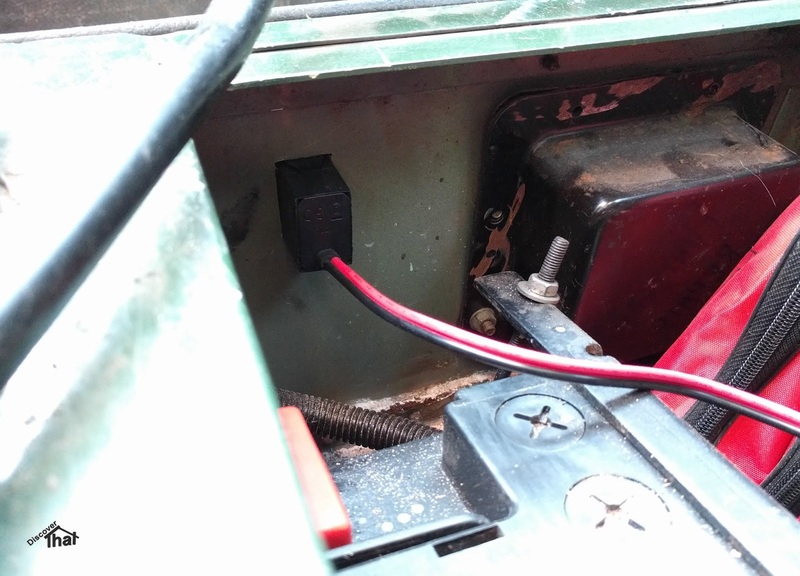 The job this weekend was to fit a charging socket to avoid having to take the passenger seat out to get to the battery each time it needs a charge. 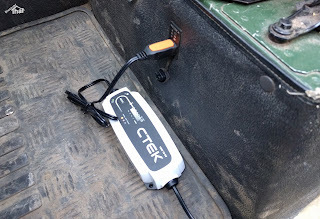 This one is specific to the Ctek brand of battery chargers but as I like their chargers that is not a problem. 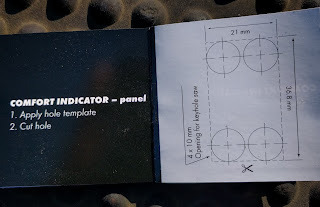 It comes with a three colour indicator for a quick, peace of mind, check. It was fairly easy to cut a hole in the battery box through to the passenger foot well, file the aluminium to size and push in the connector housing. 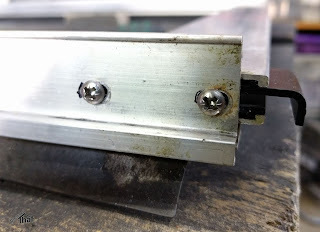 With a bit of bending the two eyelets fit the bolts on the battery terminals. Now an overnight top up is as simple as plug in the charger. 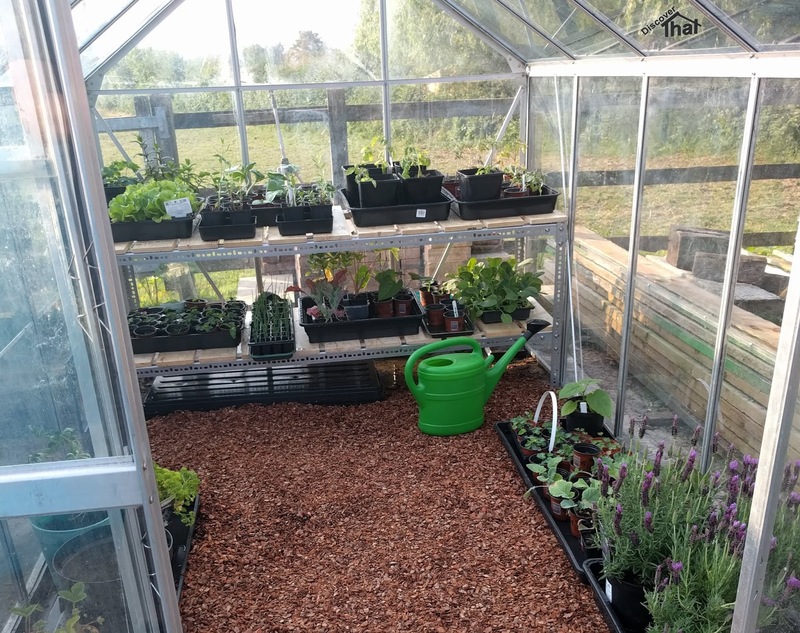 Over a year ago we helped take down a friend's greenhouse and decided we would put it up in our garden. 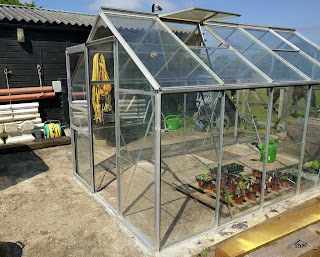 At long last I've got round to putting it up. 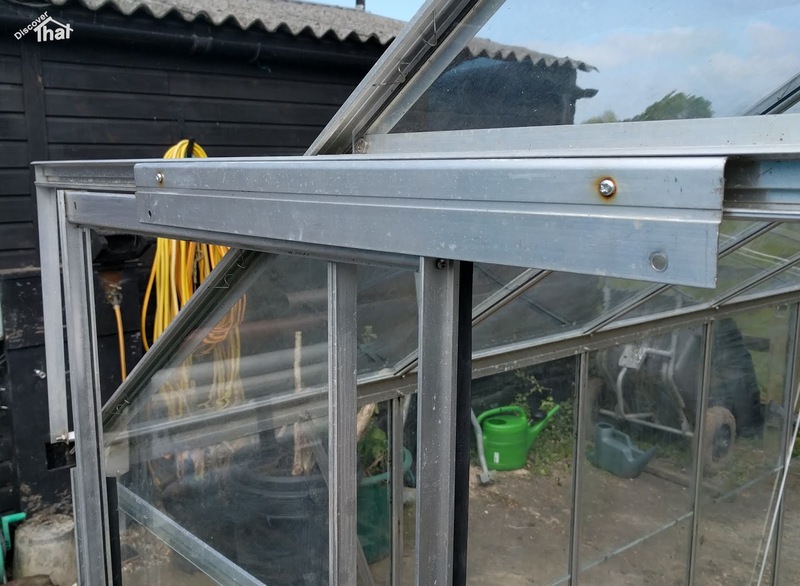 A few bits of the glass are broken or missing and the door is a bit stiff but they will be sorted as soon as the replacements and spare parts turn up.